For me, being in Paris is like being in a relationship with her. I'm completely besotted by her beauty, I catch myself doing double takes all the time. Even now going on three years. I love being in her presence, I love getting to know her different personalities and sharing beautiful moments of comfortable silence together. Of course, she isn't perfect. Nobody is and like any healthy relationship, she also likes to drive me insane from time to time. Her cold weather, frustrating administration and metro delays/strikes/station closures. But the thing is, when I'm mad at her, or feeling down or a little homesick, she seems to cotton on fairly quickly. Before I know it, she will do something cute like tell the Eiffel Tower to sparkle in the distance through the fog and freezing cold. I will look up and gush, then smile and fold because I can't stay angry at her for too long. In my head, I like to think we are seeing each other exclusively. I get a little possessive when I realise I have to share her with a million other tourists (32.3 million each year to be exact). But I suppose you don't want to be that overly possessive jealous partner. So I don't let it get to me and focus on one of my favourite things to do with Paris, waiting until it's dark to go for a wander around at night when everyone is tucked away in bed. Midnight strolls are the best because it feels like Paris and I are on an intimate date, just her and I. Sometimes when Frenchie comes along on our midnight Parisian strolls, he feels like the third wheel because I gush and sigh about Paris non stop. And because by that time there is hardly anyone left on the streets, I gush and sigh even louder..! 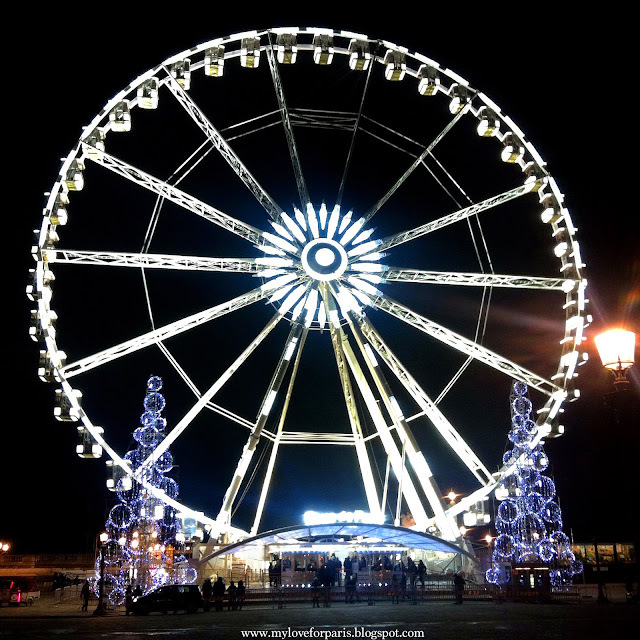 Recently, Paris took me on our annual romantic Christmas date. To see sights like this.. 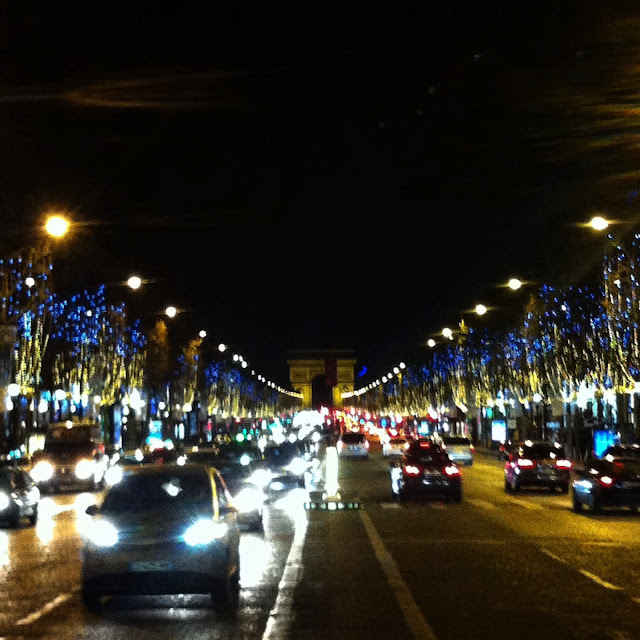 Earlier that night, we strolled down the Champs Elysées because she wanted to show me her new energy efficient and cost efficient Christmas lights. Compared to her Christmas lights in 2006, there's been a 97% reduction in energy consumption. That's another reason why I love her, we are also ecologically in tune with each other. 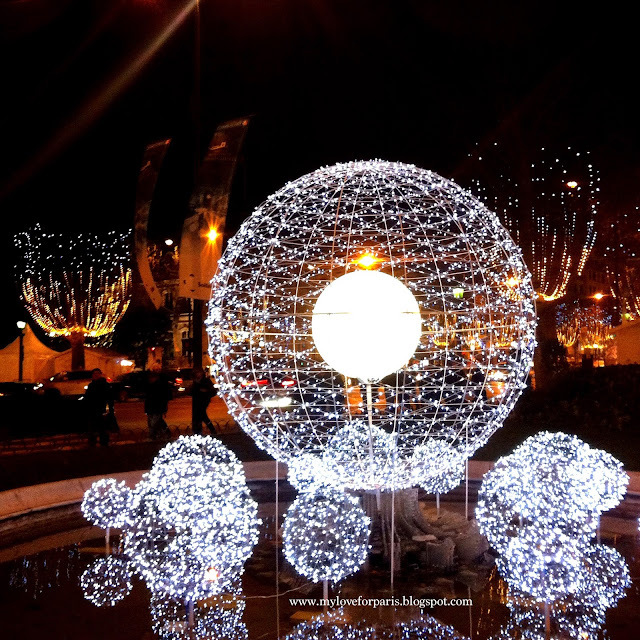 At the giant intersection, Paris showed me these cute Christmas bauble illuminations she had set up on all four corners. 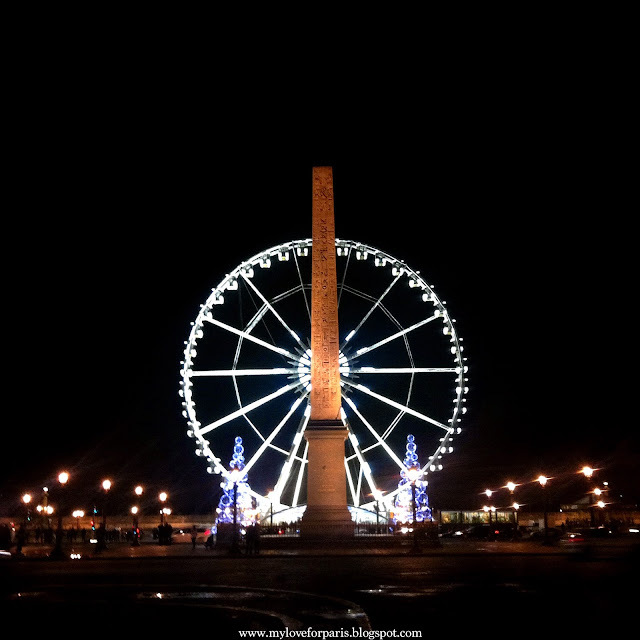 Walking further away from the Champs Elysées, we saw the Grande Roue de Paris, the giant Parisian Ferris Wheel standing behind the Obélisque. 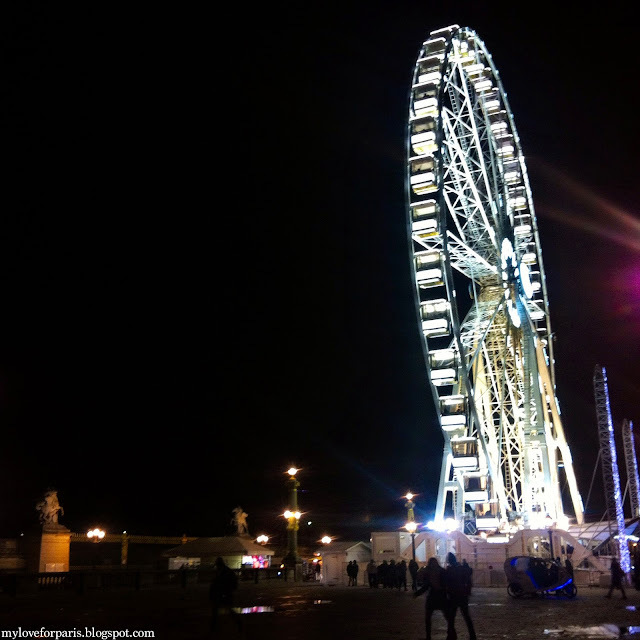 From up above at the very top of the Ferris Wheel, you can see breathtaking views of Paris that I will let you discover for yourself. We crossed the road and walked past La Madeleine. 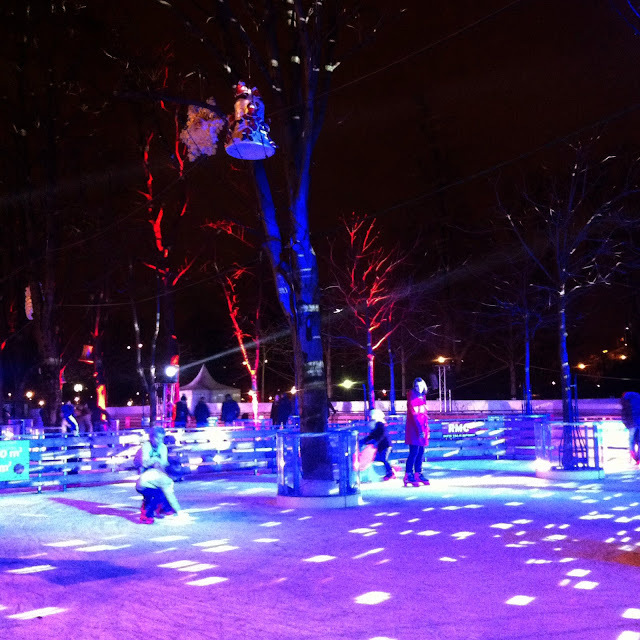 Before walking through the Christmas markets and to the ice skating rink. Here she apologised for breaking my collarbone two years ago from a fall by showing me cute little kids gliding around on the ice having so much fun. I told Paris it was okay, it was an accident and we can put the incident in the past. We wandered through the stalls, grabbed some mulled wine to warm up and snacked on hot chips with Andalouse sauce (my current favourite sauce that we tried in Brussels for the very first time earlier this year). 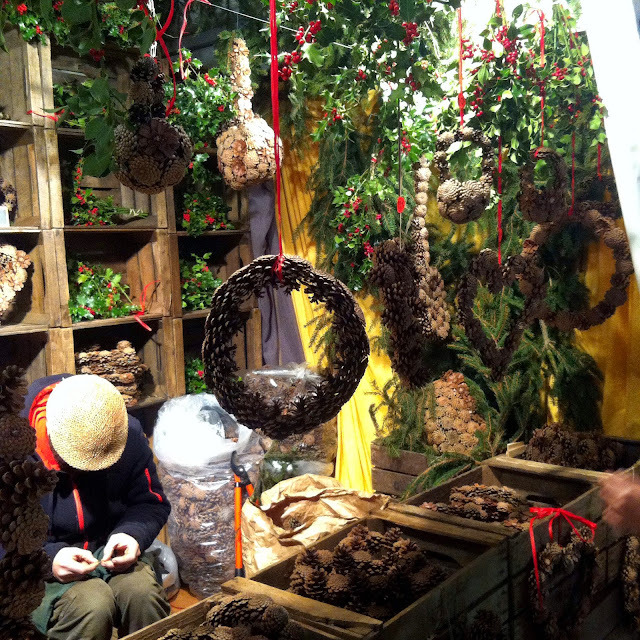 I honestly don't mind that Parisian Christmas markets can be a bit kitschy, bring it on I say. Bring on the hot churros dipped in melted Nutella, bring on 'Winter Wonderland' being played through the speakers and bring on all the rest. Because when I'm on a date with Paris, especially at Christmas time, it really doesn't matter..! I love Paris too! The magnificent ancient city with modern life where bringing so much energy,positive belief, excitement, happiness, encouragement, love.....to my dearest daughter! 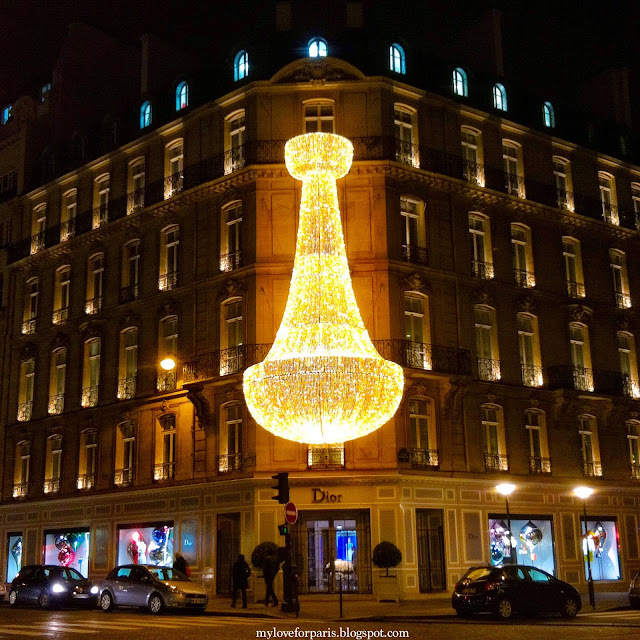 Thanks Nhan for the gorgeous article that has walked us to so many Christmas decoration places in Paris and make us feel like celebrating Xmas in Paris! Hi Nhan! 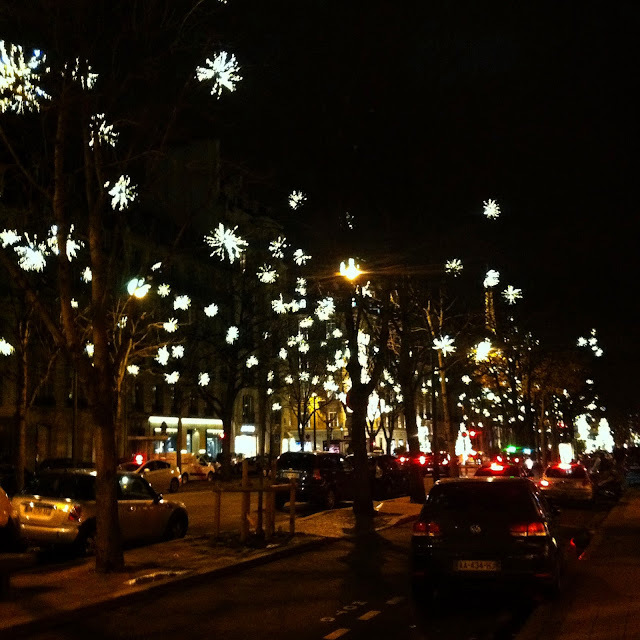 I remember loving the lights on Ave Montaigne. 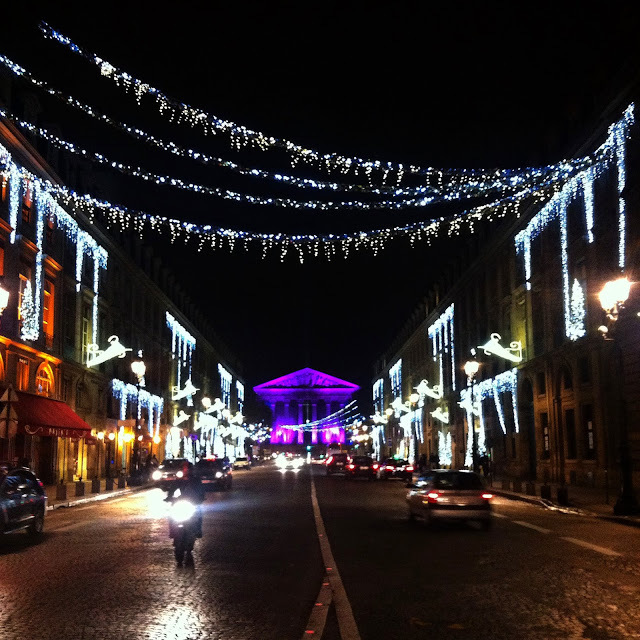 Check out Rue de la Paix around Opera as well; I wanted to grab photos there but never ended up doing it last year. Your comment is a reminder I need to reboot my blog haha. I've been a mix of busy and lazy but it's been in the back of my mind. I think we'll be back in Paris for a visit later this spring. Hope we can see each other then -- for our second date! ;) Bonnes fetes! I just LOVE the way you describe Paris!